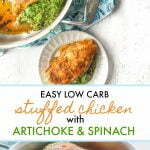 This low carb artichoke & spinach stuffed chicken dinner is easy and delicious! The filling is so versatile you can mix it with cauliflower rice too! 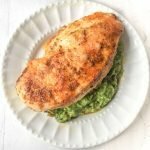 Each stuffed chicken breast is only 2.2g net carbs. 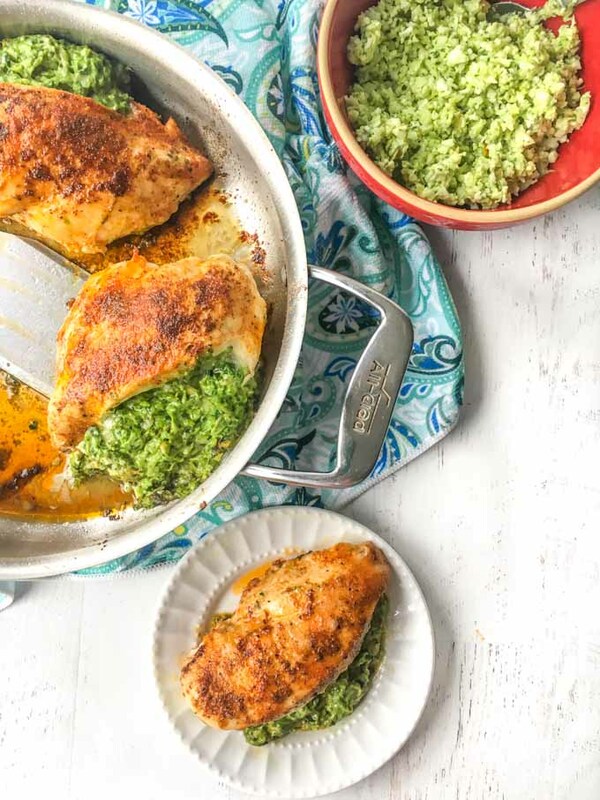 You might also like this low cab tapenade stuffed chicken recipe. While I love chicken I don’t do well with dry plain chicken breasts. 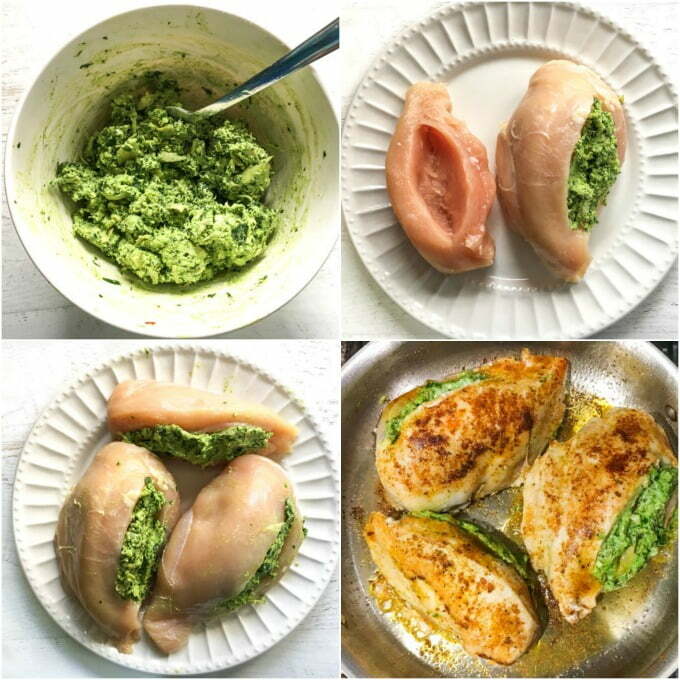 So when faced with a package of large chicken breasts, I decided to make this low carb artichoke & spinach stuffed chicken. Think of a chicken breast with a overflowing pocket of cheese, creamy artichoke and spinach stuffing. So good! Each large portion has only 2.2g net carbs and with the extra stuffing you can mix with cauliflower rice for a great side dish! The chicken filling for this dish is made up of spinach, artichoke hearts, cream cheese, parmesan cheese and garlic. Using a food processor, first add the garlic and spinach to get both nicely minced. Then add in the cheeses and pulse until well combined. Lastly add the artichoke hears and pulse to just chop them up. I only used about half of this filling in the chicken and the rest I mixed with some cauliflower rice. Below you can see what the spinach filling looks like. It’s like a very thick paste making it easy to spoon in the chicken. Take the boneless, skinless chicken breast and make a slice on the side as you would a bagel. Then take your finger sand make a pocket where the slit is and add in the filling. Next you want to sprinkle the spices on both sides of the chicken and brown on both sides. Make sure to use an oven proof pan. 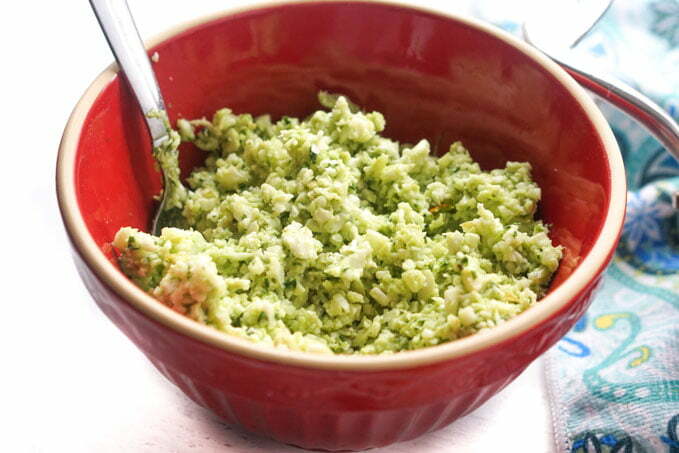 To make cauliflower rice, just take some florets and pulse in a food processor until they look like grains for rice. Mix with the left over filling and then microwave for about 5 minutes until the cauliflower is cooked. You may want to add a little salt or pepper if it needs it. In a food processor, add the garlic and baby spinach. Process until finely minced. Add in the cream cheese and Parmesan cheese and mix to combine. Lastly add in the artichoke hearts and pulse a few time to chop them up. Cut a slit in the side of each breast as you would a bagel. Don't make the slit too large as you can use your fingers to make a pocket big enough for the stuff. Next spoon the mixture into the chicken breasts and place on a plate. Mix the spices and sprinkle on both sides of the chicken. In a large oven proof skillet, heat up the oil and then pan fry the chicken about 3 minute on both sides to brown them. Take them off the stove then place them in the oven. Bake for about 17-20 minutes or until the internal temperature is 165 degrees F.
NOTE: You should have quite a bit of leftover filling. You can use this with cauliflower rice or regular pasta or rice. Just mix with cooked rice and microwave for about 5 minutes. absolutely lovely looking dish. I love the combo of chicken with spinach. I have made this combo before, but never tried it as a stuffing. great idea. will surely try this. This looks absolutely mouthwatering!!! Loving how you spiced this chicken up!! I too get so sick or boring chicken. I need some flavor and that’s exactly what this recipe brings!! Oh, this is yummy! 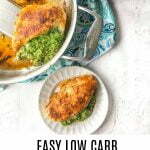 This is perfect for low carb dieters. This looks perfect! It’s like all the best parts of spinach and artichoke dip, but healthier and appropriate for dinner. I love it! Oh my this looks so amazing! 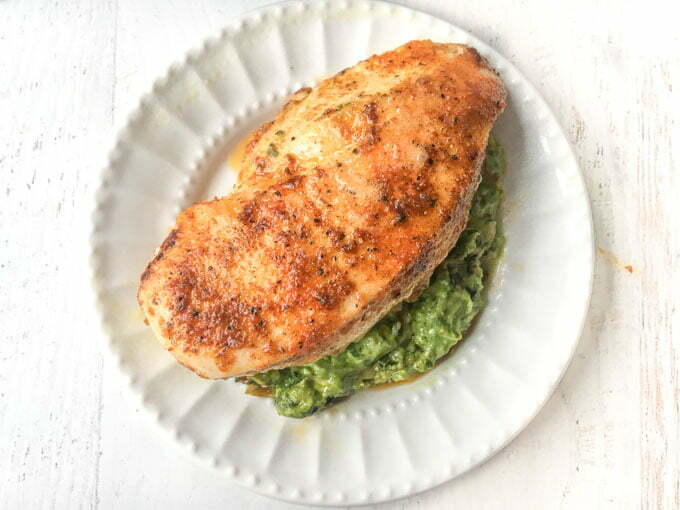 I love spinach and artichoke dip, but have a love/hate relationship with chicken breasts. This looks like a great way to make the chicken moist and flavorful. Thanks! What a great idea for chicken! This just sounds so yummy and like a great recipe for really taking chicken, which I find myself getting bored with sometimes, to a whole new level! Yummm! This looks so good! Like a little pocket of happiness! 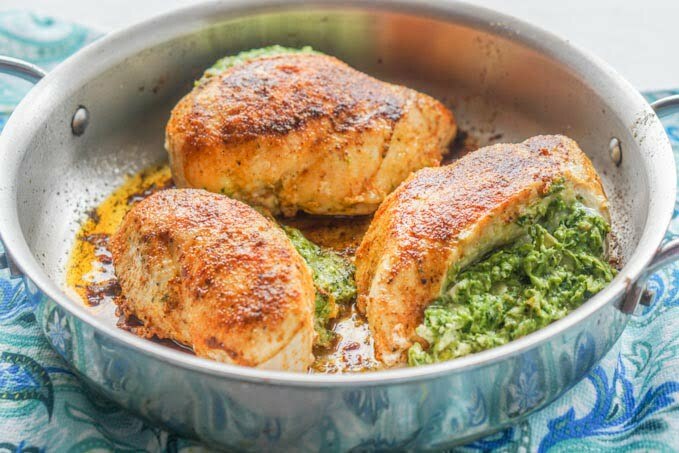 😉 I always love spicing up a traditional chicken breast recipe — I’ll have to try this out soon! I’m always looking for new recipes for chicken. This looks really yummy! This is just the type of recipe I’d love having during the week. It’s full of flavor and I’m sure the filling would make sure that the chicken isn’t dry. I certainly putting this recipe on this weeks menu. I love artichokes and spinach together and your instructions for putting this dish together seem super simple and easy. This sounds like a delicious dinner that looks like it took much more effort to assemble than it really did (my favorite kind!). 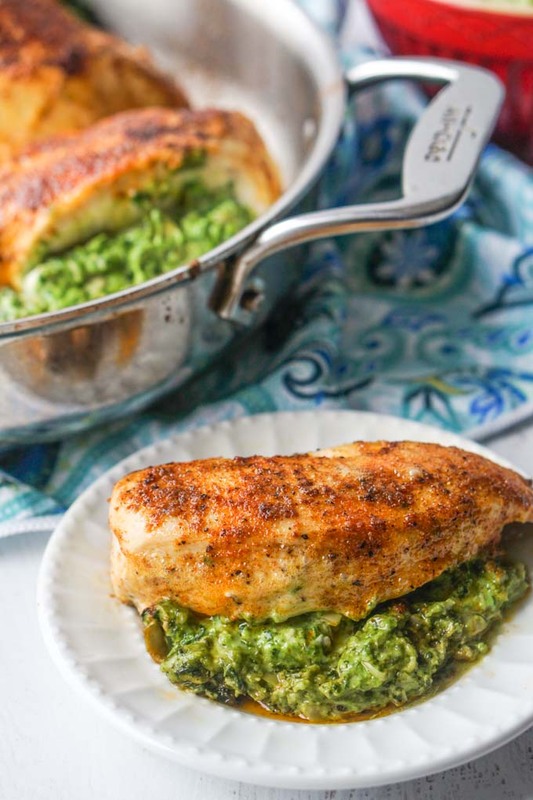 Spinach and artichoke dip stuffed into chicken – yum! I should not be reading this right before dinner, because now I want this for dinner, but there’s always tomorrow. We have been keto for a while, and keeping variety (plus trying to make easy meals sometimes) can be a challenge. I am so glad I received he email for this dish!! We are trying it tonight. I made a few tweaks – no fault of the recipe… it’s my fault for not having the ingredients on hand lol. I had to use boneless/skinless thighs instead of breasts, which our family has actually come to prefer. I also didn’t have artichokes on hand, so we took those out. For the Parmesan, we used mozzarella. Otherwise, we stuck to the recipe, and it turned out delicious! The filling was wonderful, and I look forward to trying it as written also! Thanks for always keeping great recipes coming to my inbox!!! What a beautiful chicken dish! I love the flavors you have in this, I think it will be going on my menu next week! Look forward to trying it! TBH, chicken breast is my least favourite chicken part. Coz you’re right, it can be dry plain and tasteless. This looks anything but though!! Looks sooo tasty and juicy. Great way to dress it up. Delicious and yummy and perfect and a must try option for sure. You can never go wrong with a great chicken recipe. This looks delicious. Love artichokes. Presentation perfect for entertaining too.